Right then..Key West is it?. You want to come to the Southernmost Island of the Florida Keys? What shall we tell you about it first? What is it about this tiny little place at the very end of Florida, that makes it unique. Well you could look at its location for a start. The Conchs (Natives who live here) are more than proud to claim the status of the Southernmost Point in the United States. It gives it its own special heartbeat. A laid back, tropical beach, sun worshipping haven. A place where everything is COOL. The breezes that blow off the Gulf of Mexico, to the women that swarm around the beaches like bees around the proverbial honeypot, all have a swagger that is pure Key West. And its not a surprise to find so many people strolling contentedly around the streets, when you know that the weather here is nothing more than perfect.....as long as you are dodging the hurricane season. But hey, we can fill you in on the perfect time to visit. But let's get down to the nitty gritty. First of all how do you get here? Well, the island does have its own Keys airport which for many years wasn't the type of airport to say "Go for it, fly straight into paradise." It hadn't quite caught up to the demand of the incoming travellers and provided the great flights to the southernmost island that everyone wanted, but that all changed in 2009 when the airport doubled in size. Now the facility down at South Roosevelt Boulevard is an extremely convenient entrance point to the Keys, although you may have to change and grab a small commuter plane from other locations such as Miami Airport. But flying all the way down is just one choice, as you can also of course drive all the way down US1 which takes about three and half hours, if you hit no traffic at all. Which if that happens then you deserve to have your whole vacation paid for you! Lastly, make sure you check out the cool ferry service that runs from Marco Island, Ft Myers down to, as they say paradise. It takes about the same time as the car, and you definitely won't be hitting any traffic as you sit in the sunshine, sipping a nice cool beer. One thing for sure, this is not a place where you can get your rest. If you have had a hard time in the office and are looking for a place to recharge your batteries then perhaps America's southernmost island isn't for you. What you will find is more bars per capita than any other city in America. You will find an eclectic mix of nightclubs, bars and pubs and attractions that really never close down. If you have the energy you could be drinking with your mates and families until 5:00am, to then get a few hours shut eye before things start again at 11:00am. Get Ready To Dodge The Tourists At The Southernmost Marker! So if you like a place where the nighttime is for sleeping and quietness. If you like a place that believes that rules and regulations should be upheld. so named as you will highly likely be on all fours if you manage to get to the end of this amazing and vibrant street. It will be a night to remember.....if you can remember it afterwards! But don't go to hard on the old booze, as you will miss out on some of the great attractions and things to do that make the place so popular. For such a small place there are a hell of lot of things to do in Key West. And unlike some of the major tourist destinations in America, many of them are free. The best thing to do to plan your day, is look to do everything in blocks. The map of the island is like most cities in gridform, so instead of choosing the attractions because you just fancy them, look to group them in areas, which will mean that you arent trapising across town all the time. Although the images above are not truly representative of the things that my family and myself think are the best of Key West attractions they are well worth checking out. For the full and ever increasing guide of attractions then jump straight to this link below as we will be adding more as soon as possible. Lets give you some information for just a few of the local hotels and inns that are scattered around the tightly wound streets of Key West. We will be adding more as either ourselves or our readers give us their thoughts to the best, cheapest or just plain mad of what is on offer. One thing is for sure, you must look closely at your budget before you start booking your accommodation in Key West. Being a prime tourist attraction, the island is not renown for the budget type of sleep over....although it can be done, if you are not overly fussy. And that is certainly the case if you are planning on staying at these Duval Street Hotels. But for many people they want either hotels for that bit of romance, prime location, or even those that cater primarily for the gay community. Our suggestion would be to start with the location, as the northern end of Duval Street is much quieter, which of course is what you want after a heavy night on the town. And then take a closer look at the budget. We certainly wouldn't want to spend the lot on the room, to leave nothing else to enjoy the place with. For such a small place the island has masses of history, to take you back in time.....become a kind of Marty McFly in shorts and sandals if you will. We certainly recommend before you do anything, and head about and about, spend your first few hours, travelling around on one of the trolley tours that you can see driving around all over the place. The drivers are incredibly knowledgeable on not just the places to see, but will give you insider tips as to what time to visit to miss the crowds and stuff. If you do want to go to the mansions and houses that have put a roof over important dignitaries and writers throughout the decades then these guys are the ones to point you in the right direction. There are three main operators marauding around the streets that we highly recommend, the first being the The Old Town Trolley Tours who have been operating for years and years. The second are the company that operate the Conch Tour Train, and the third the scary Ghost Tours which as you can imagine go out at night. You can even use them as a day bus, and save your tired legs for a while, as you watch the crowds come in and out of the bars, restaurants, and attractions that make this part of the Florida Keys the intoxicating mixture that it is. People watching in comfort, with a cast of thousands. How about the history of the city? Well we can tell you that ever since it was first discovered and documented by the Europeans, Key West Florida has been known by lots of different names. Cayo Hueso being the first, followed then by Bone Island. The Spanish first claimed it as their own in 1513, and still to this day many of the real estate titles date back to this time. It stayed with the Spanish until 1763 when the English took hold of it. However twenty years later it returned back to the Spanish. All this time it was known as Bone Island. We don't know about you but when a friend asks "Hey Guys, where you going for vacation this year?" Replying "Key West" is a lot easier to explain than "Bone Island." I think they made the right decision! 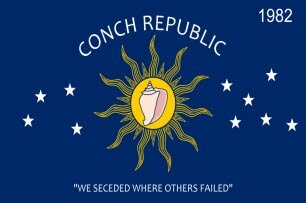 And then of course in 1982 the Conch Republic was formed. The original protest event was born when a U.S. Border Patrol put up a roadblock and checkpoint on the road leading into the Keys. As you can imagine having to pass through a check point as you made your way home was not appreciated by the greatly inconvenienced residents. And of course if you have ever travelled down US1 you know that it can be a bit slow anyway....even at the best of times. Add to this a border patrol, and many feared that the tourism which is so valuable to the area could be damaged. 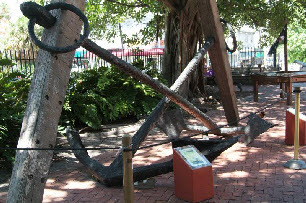 Although the Conch Republic is not, and never was, a real movement, many in Key West continue to identify with the concerns that motivated the original protest. The Conch Republic celebrates Independence Day every April 23 as part of a week-long festival of activities involving numerous businesses in Key West. In 1885, a trolley line was first seen on the streets of Key West. Known as the Key West Street Car association, it had open sided cars, with simple benches in it. In those days they didn't quite get to having an engine so made do with two mules to pull it all along. Suppose it was still better than walking! But let's not just stay in the past, as Key West has so much more to offer. If you fancy a walk, and why not when life is so leisurely in the Florida Keys, you can stay within the shade of the palm trees lining the streets and view homes, both spectacular and famous. 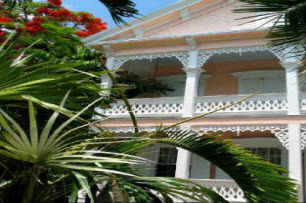 You will see classic architecture that are pure Key West, such as the colourful gingerbread mansions, conch houses covered with their unusual tin roofs and even places where the famous have come to rest, such as Harry Truman. Little White House, and of course who could visit the island and not go to the home of Ernest Hemingway. Follow the well trodden path that has felt the steps of such luminaires as Mr Thomas Edison and even Tennessee Williams who wrote many of his most famous works whilst spending time here. And walking may not be such a bad idea anyway as parking in Key West can be a little bit difficult at times. But on a more positive note, maybe you want to experience the most spectacular sunsets you'll ever see at Mallory Square. This is THE place to join the thousands of tourists who flock to this small square to watch the sun go down over the Gulf of Mexico, and to join in the "Sunset Celebration". Whether you are relaxing on vacation, on business or just passing through, you'll find that old America's southern most island is one of the true architectural and botanical treasures. West Martello Tower being just such a place, that mixes relaxation, history and botany all in one magical location. And also if this floats your boat then a quick trip to the Butterfly Conservatory is a wonderful escape from the hustle and bustle of the city. Down here at the Keys it's like time has stopped, as you walk through perfectly preserved lanes and streets, that have been restored with all the love and care you will come to see as normal. With its fantastic weather, that spoils us all on a daily basis, the island is an absolute draw for those who love the outdoor life. Whether you love diving, fishing, watersports, golfing, or even a wild nightlife then the Old Town can deliver. If you are looking for the best beaches you can find, then you have come to the right place. 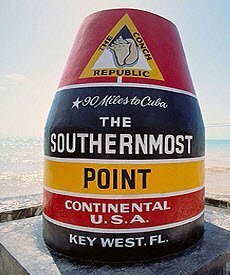 However many of the ones at the Southernmost point of America are not what you would consider as the worlds greatest example of sand and water combining. US1 Radio The number one radio station in the Florida Keys. Great fun, great advice and best of all the kind of music that makes anyday, anywhere, a Florida Keys kind of day. The official website for Key West.